Any medical condition that affects joints, skin, tendons, ligaments, nerves, or blood vessels can contribute to foot problems. Osteoarthritis, and other arthritis disorders that affect the joints, is the most common medical condition associated with feet and ankle pain. Diabetes is the most common nerve and circulatory related disorder associated with feet problems. High-impact exercising, such as jogging or strenuous aerobics, can injure the feet and ankles. Common foot injuries include corns, calluses, blisters, muscle cramps, damage to toenails, plantar fasciitis, Achilles tendinitis, and metatarsalgia (pain at the ball of the foot). Poorly fitting shoes are a frequent cause of foot pain. High-heeled shoes concentrate pressure on the toes and can aggravate, if not cause, problems with the toes. OA is a degenerative joint disease that causes progressive loss of cartilage, the smooth material that cushions the ends of bones. It is the most common form of arthritis. In feet, OA primarily affects the big toe, midfoot, and ankle. It typically affects one foot. RA is an autoimmune disease in which the body's immune system attacks joints and other tissues. RA can affect the small joints in the feet and ankle. Unlike OA, RA usually affects similar joints in both feet. A type of arthritis caused by a build-up of uric acid in the blood. Gout usually affects the joint in the big toe, but it can also attack joints in the ankle or elsewhere. are composed of the same material as corns. Calluses, however, develop on the ball or heel of the foot. The skin on the sole of the foot is ordinarily about 40 times thicker than the skin anywhere else on the body, but a callus can even be twice as thick. 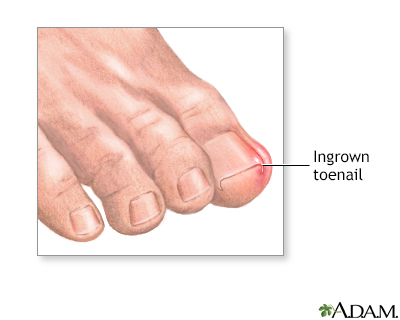 , causes the bone and joint of the big toe to shift and grow inward, so that the second toe crosses over it. 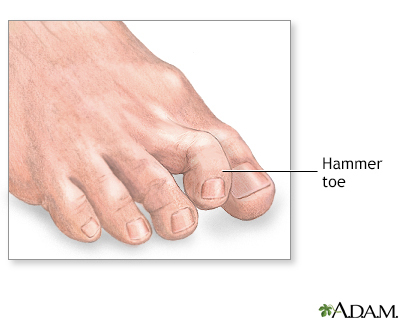 The second toe may grow over or under the big toe as they cross over. This can cause corns to develop. , or pes cavus, is a deformity of the foot marked by very high arches and very long toes. The toes are pointed down and the arch is high, making the foot appear claw-like. Clawfoot is a hereditary condition, but it can also occur when muscles in the foot contract or become unbalanced due to nerve or muscle disorders. 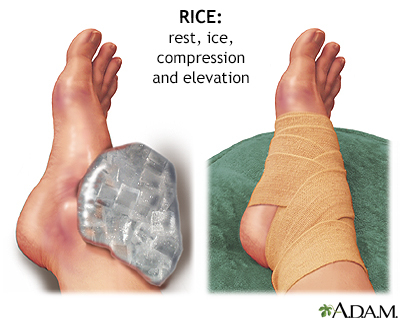 A rigid orthotic is used to control motion in two major foot joints that lie directly below the ankle. They are often used to prevent excessive pronation (the turning in of the foot). A soft orthotic is designed to absorb shock, improve balance, and remove pressure from painful areas. They are made from a lightweight material and are often beneficial for people with diabetes or arthritis. A semi-rigid orthotic is designed to provide balance, often for a specific sport. It is typically made of layers of softer materials reinforced by hard material. Reviewed By: Thomas N. Joseph, MD, Private Practice specializing in Orthopaedics, Subspecialty Foot and Ankle, Camden Bone and Joint, Camden, SC. Review provided by VeriMed Healthcare Network. Also reviewed by David Zieve, MD, MHA, Medical Director, Brenda Conaway, Editorial Director, and the A.D.A.M. Editorial team. Editorial update 09-26-18.